Learn how to set up a trauma-informed service project that will create impactful change in your community. This three-day professional development training is for yoga teachers, yoga therapists, and fitness professionals who are committed to serving the underserved. $300 with Early Bird Special! Save $50 if you sign up by October 4, 2019. $350 after October 4, 2019. All net proceeds of this training go directly to support the work of Light a Path. ​Lodging Available - $60/night shared room, $95/night private room. 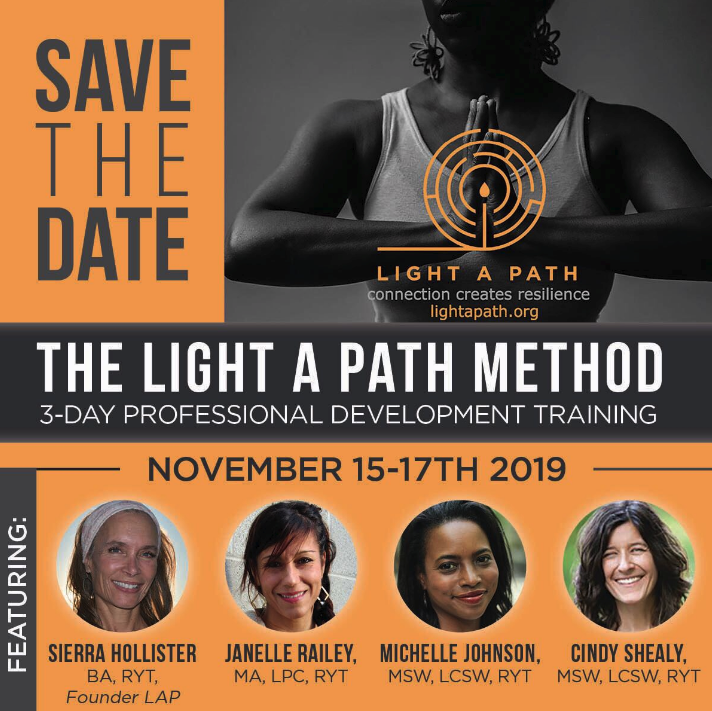 For the first time ever, Light a Path is thrilled to partner with Asheville Yoga Center to offer a weekend long professional development training for yoga teachers, yoga therapists and fitness professionals interested in learning the ‘Light a Path Method’ to create impactful change in their communities. This is a foundational course where participants will be trained in trauma-informed instruction, and in understanding power, privilege and oppression, as well as being introduced to techniques for sharing wellness modalities (including yoga and meditation) with underserved populations. Additionally, attendees will learn about responsible bystander intervention, the ethics of self-care, and the logistics of establishing service-based programs. Participants will leave with an understanding of everything one needs to create resilience through connection in their community. All net proceeds of this training go directly to Light a Path. 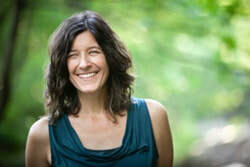 ​As the founder of Light A Path, Sierra brings a wealth of inspiration, knowledge and experience. She will welcome and orient participants to the Light a Path Method and introduce you to a variety of techniques as well as share LAP success stories. Sierra considers herself a “yoga universalist,” holding teacher certifications in multiple lineages and styles. She has been teaching Kundalini Yoga for over 20 years and is on the teaching staff at Warren Wilson College, Asheville Yoga Center and West Asheville Yoga. She is also a featured teacher on Yoga International. ​Passionate about social justice and its relationship to yoga, Michelle joins the LAPM faculty to lead participants through an exploration of individual and collective power, privilege and oppression as a way to create change and transformation. Michelle is a licensed clinical social worker and yoga instructor residing in Winston-Salem, NC. Working with individuals and groups, she leads anti-racism trainings, yoga workshops focused on the intersection of justice and yoga, and offers intuitive healing sessions to support social justice workers, healers, and activists who are on the front lines and struggling with how to sustain themselves as they do their good work in the world. She has recently written a book titled, Skill in Action: Radicalizing Your Yoga Practice to Create a Just World, which can be found on her website. ​A regular teacher of yoga and trauma at Asheville Yoga Center, Janelle shares her years of wisdom and experience as a psychotherapist and yoga instructor to help participants become effective trauma-informed instructors. She holds a masters degree in Contemplative Psychotherapy from Naropa University and is currently a student at the Philadelphia School of Psychoanalysis. Additionally, Janelle has extensive psychotherapy training, over 1000 hours of yoga certification, and a 20 year mindfulness meditation practice. She also has a well established private practice in Asheville, NC, serving individuals and couples. Cindy is a certified EMDR Consultant, registered yoga teacher, and expressive arts therapist. She joins the LAPM faculty to teach participants how to develop strong psychological first aid skills as well as understand and implement the art and ethics of self care. Cindy has a thriving private practice in Asheville, NC where she works with individuals and leads community expressive arts workshops in the area. Her “whole person” approach incorporates the therapeutic tools of Ecotherapy, Sensorimotor Psychotherapy, mindfulness, humor, creativity, yoga, movement, and a healthy dose of curiosity and self compassion. Module 1: Orientation to LAP - mission, values, inspiration and standards. Module 2: Trauma-Informed Instruction: creating a trauma sensitive classroom, developing literacy around trauma and neurobiology. Module 3: Social Justice - understanding power, privilege and oppression as it relates to the populations we serve. Implicit bias, person first language, how to impact positive change. Module 4: Ethics of Self Care & Psychological First Aid - responsible bystander intervention, recognizing vicarious trauma, giving from a full cup, scope of practice, recognizing limitations. Module 5: Principles & Practices - modality considerations, practical applications of teaching, managing classrooms, implementation of techniques. Module 6: Logistics - how to get a LAP-informed program started, creating a bigger impact, the business of doing this work, obstacles, support/consultation.